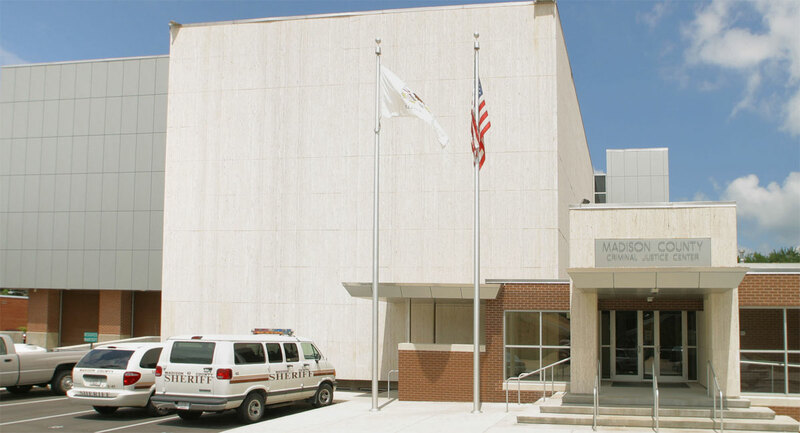 A focus on the practical distinguished the rehab of a vacant building which became the new Madison County Criminal Justice Center in Edwardsville, Illinois. Aluminum composite material (ACM) panels of Alucobond Material were chosen to blend with existing travertine panels and provide “a basic metal look,” according to Frank Wiseman, Vice President of Architecture for Lefferson & Associates, Inc. of Alton, Illinois, the architectural firm that designed the new Center. 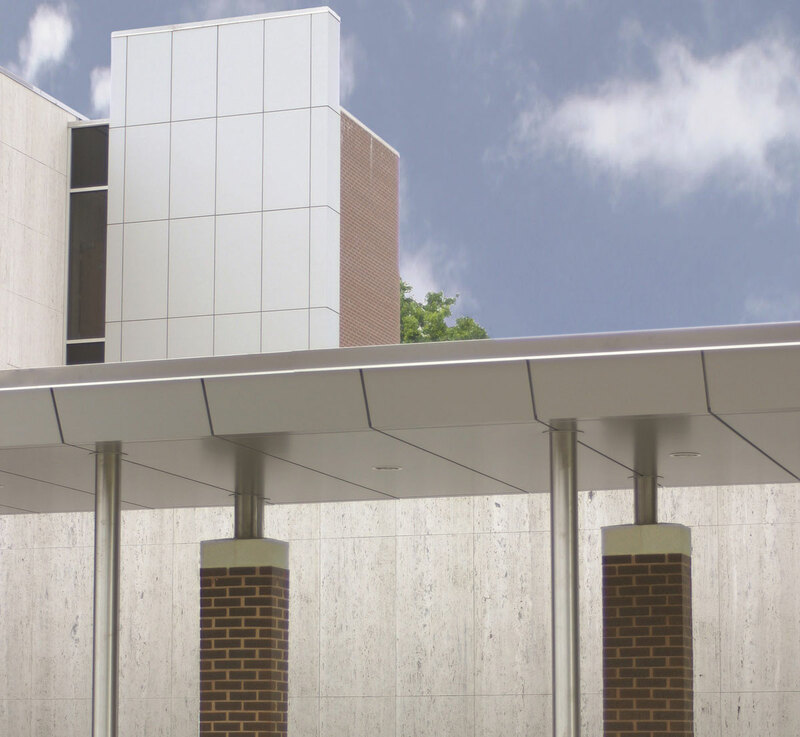 Both the Alucobond Material and travertine panels complement brick on the renovated project, which opened in early March, 2005. More than 8,200 sq. ft. of 4mm Alucobond Material in a Champagne Metallic color was used for the project. The ACM product was fabricated, including field fabrication, by Universe Corporation of St. Louis, Missouri, and attached by their rear-ventilated “rainscreen” system. In recognition of their work on the project, Universe Corporation received a 2005 St. Louis Chapter AIA Design Award for craftsmanship. R.W. Boeker Co. of Hamel, Illinois, was general contractor for the project, which involved gutting the previously existing building. 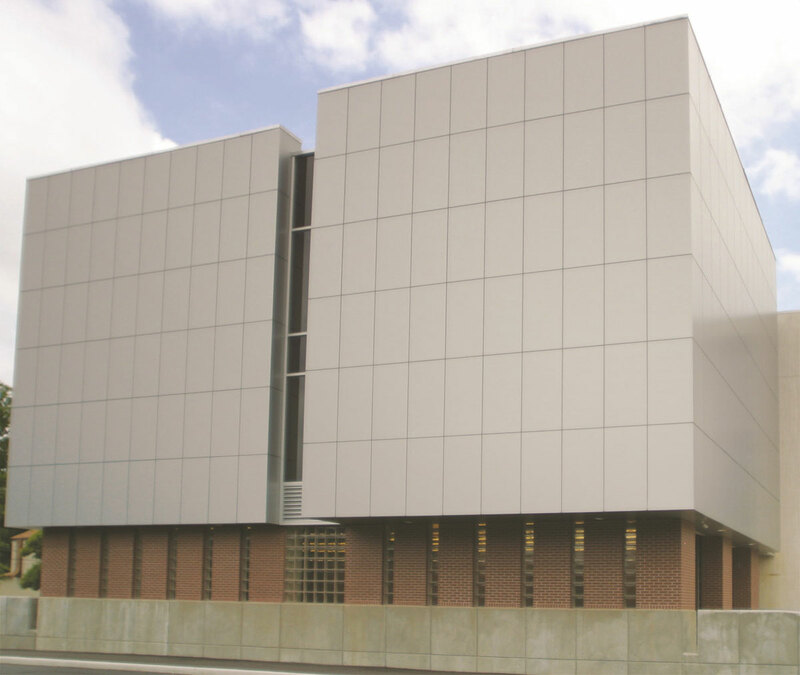 Justice centers are among the wide range of buildings where Alucobond Material has been used as exterior panels. The metal look contributes to both a secure and “high-tech” image, reflecting the sophisticated technology in place at such facilities. Yet the material also is often chosen for its fabrication ease and long-term maintenance considerations.